All NC-RETS Projects can submit generation data and prior period adjustments 2 years prior to the current month. Generation data will be reported to NC-RETS by a Qualifies Reporting Entity (QRE) or Self-Reported after the end of the vintage month. Check with your QRE for their data reporting timeline. A Data Validity Check is performed for all data reported and assigned a status on the Account Holder’s Generation Activity Log. The Generation Activity Log can be accessed via the Account Holder Reports module for the account dashboard. NC-RETS will notify the Account Holder via email that the data has been posted. Current Period Generation can be reviewed, Accepted or Disputed by the Account Holder for 14 days. Once QRE loaded data is accepted by the Account Holder, Certificates will be immediately issued. Self-Reported Data will be set to an Account Holder Accepted status and issued the next day. NC-RETS Accepted data that is not Account Holder accepted or Disputed after 14 days will be used for certificate issuance 15 days after the data was loaded. Loaded Data can be reviewed from the Asset Management Module's Review Data/Self-Report column. The date displayed in this column is the last vintage loaded. Generation data in an NYGATS Pending status due to multi-fuel allocations not being entered will issue Certificates when the annual settlement is run using the primary fuel type. 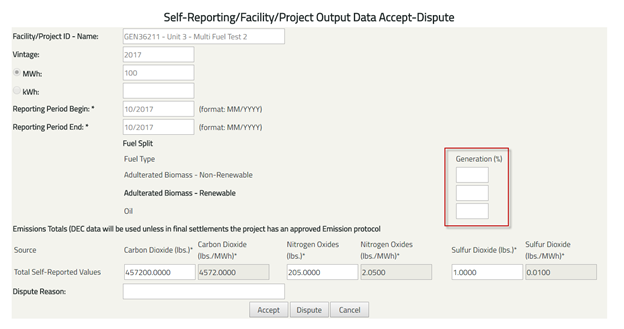 The Account Holder can login to the data review screen of a multifuel project with pending data by accessing the Review Data/ Self Report column located in the Asset Management Module. Select the NYGATS Pending Status hyperlink to review the reported data and enter the allocation (percentage) of the fuels used during the month. Occasionally there may be debits and credits in the current period as data is finalized or resettled, requiring a Prior Period Adjustment. The hyperlinked value in the Adjustment New column can be selected to approve or dispute the Prior Period Adjustment. Prior Period Generation can be reviewed, Accepted or Disputed by the Account Holder for 14 days. Once QIP or NYISO Loaded data is accepted by the Account Holder, Certificates will be immediately issued. NYGATS Accepted data that is not Account Holder Accepted or Disputed after 14 days will be used for certificate issuance 15 days after the data was loaded. 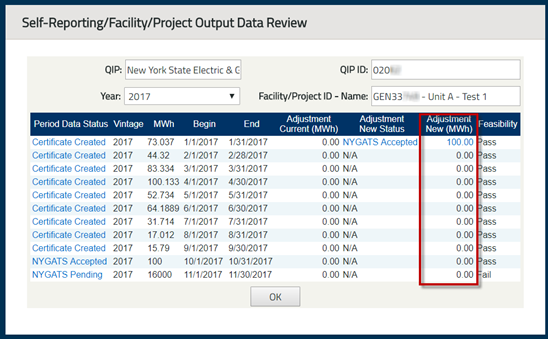 The Prior Period Adjustments will be displayed Adjustment New (MWh) column of the Self-Reporting/Facility/Project Output Data Review screen. If new Certificates are created resulting from an adjustment, the vintage of the Certificates shall reflect the month and year of the generation being adjusted. If Certificates must be debited, fewer Certificates will be created for the current period. After the Settlement Date associated with the Vintage Year, no further adjustments will be accepted by the NYGATS Administrator.